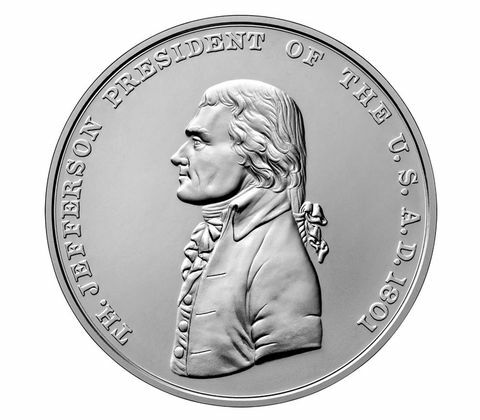 WASHINGTON – The United States Mint (Mint) will begin accepting orders for the Thomas Jefferson Presidential Silver Medal (product code S803) on January 25 at noon EST. The medal is the first of four .999 fine silver presidential medals slated for release this year. The reverse (tails) depicts a symbolic handshake of friendship between the American government and the Indian nations. Above the hands are a crossed pipe and tomahawk, with the inscription “PEACE AND FRIENDSHIP” intertwined through the design. The design is by John Reich. The medal arrives packaged in a clamshell case with a standardized Presidential Silver Medal Certificate of Authenticity. The Presidential Silver Medals have the same designs as their bronze counterparts and are being issued at a rate of four per year. They have a matte finish similar to an uncirculated coin. (Note: The term “uncirculated” is exclusive to coins.) The medals may be produced across multiple production facilities and will not have a mint mark. The Mint accepts orders at www.catalog.usmint.gov and at 1-800-USA-MINT (872-6468). Hearing- and speech-impaired customers with TTY equipment may order at 1-888-321-MINT. Information about shipping options is available at www.catalog.usmint.gov/customerservice/shipping.html.